The Best Gifts from the Holidays | Let's Go Chipper! Did you make it past the finish line? The race to wrap packages, make it to parties on time, spend time with family you only see once a year … and then finally blow the horns at another year gone by – too quickly. For many, it is often a time of reflection but we don’t even do that well, as we’re all to set on creating goals for the New Year. Forget about the past, it’s time to begin anew. What are you most proud of as a person this year? What is the best moment(s) that included a family member or friend in 2014? What do you wish you could have become better at doing last year? What interest would you like to learn more about? The last question helped us decide on which organization we would like to spend more time with this month – so needless to say January is going to the dogs as we wrap our Making Change for the Better can with support for Rocket Dogs. Fostering dogs became a big part of our life in 2014 and it looks like we will continue into 2015. Click here to download, print and color a can label for supporting dogs or check out our other causes! If you are considering making goals as a family this year, know that research shows sharing your goals will help you stay with it as the support keeps you committed. 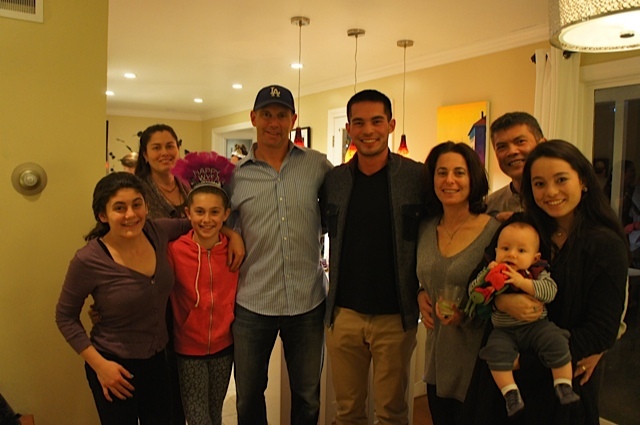 Our New Year’s Eve party this year included meeting new family and welcoming old friends into our home. I want my children to know their family story so we decided to have a Vision Board Table to help break the ice. My girls coordinated the craft; this gave them the opportunity to ask questions of cousins they had just met, and realize similar interests. I doubted the success of the activity earlier in the day, but was so excited to see everyone take part and realize the importance of connecting at a table over food and conversation … and crafts! All you need to start is some old magazines, scissors and glue, and a paper or cardboard (we used manila folders!). Our first week in the New Year includes a Family Time Capsule – think we’re overdoing it? Maybe so, but it was all so inclusive and helped start the year on a new page everyone could be a part of. The Family Time Capsule was made from a recycled oatmeal container, a great reminder to reimagine what you already have! With a fun, decorative wrap and a few notes and trinkets we are underway. The goal is to drop things in that have meaning in the moment and then we will review at the end of the year – I’m not sure my youngest will be able to wait that long! Share a story from your childhood once a month – this will help your child understand their family history and foster a sense of belonging. Family Game Night – be puzzled by the thought or allow yourself to get into a little Trouble (hint, hint). Even going outside to explore your own backyard can become a game! Here are some ideas. Make Change for the Better – Each month download and choose a cause to get to know and possibly volunteer or support, or pick an activity you want to do as a family and see if you can save enough up to make it happen. Click here to get started! Make Mealtime Matter – At least once a week, join together in the kitchen be it breakfast or dinner and then connect as a family at the table. See if you can make it a daily occurrence by the end of the year. Remember our Meatball Monday? Building a family foundation takes time and support. Time comes first though, and everything we do isn’t measured by how much time we spend but by the quality of the moment. How will you embrace 2015? Share with Chipper in the comments below or chime in on Facebook! Entry filed under: Chipper Activities, Chipper Stories, Chipper Tips, Connecting Family, Family Activities. Tags: activities for kids, activities with kids, connecting with family, connecting with kids, DIY Time Capsule, Family bonding, Family Time Capsule, family traditions.